The Nelson home at Sunnyside. Other than a couple years in the Northwest with her husband and two young children, Ruby lived her entire life on two farms/ranches, both just a few miles from Durango. His wife didn’t totally approve, but John Malcolm Nelson loved to play the fiddle, sometimes on the ride to town. 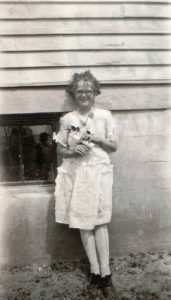 Her brother and sister were born in Ouray, John E. in 1909 and Amy in 1910. Ruby, born at the Nelsons’ Sunnyside ranch south of Durango, was separated from her sister in age by six years. That was good and bad. The down side was that she didn’t have a sibling at a similar stage of life. The up side was that Amy was willing to share her school smarts, and she taught her baby sister to read before Ruby even set foot in a school. John M. and Myra ran the farm, and put the kids to work as soon as they were able. Chores were endless. For a while there was no well on the property, so they had to fetch water from a spring a mile away. An irrigation ditch supplied household water, but it froze in the winter. It was several years before the Nelsons dug a well. 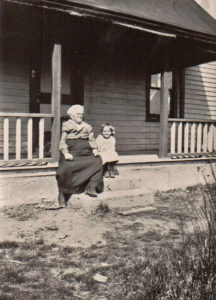 Ruby with Grandma Esther Eggleston. They produced much of their own food, and also sold what they could to furnish material goods. Cows provided milk, and from that the Nelsons produced cream, which they’d put in cans with brass ID tags and send to town. Rail tracks coming out of Durango split at Carbon Junction, one route going to Ignacio and other points south and east. The other route, constructed in 1905, just a few years before the Nelsons showed up, headed toward Farmington, New Mexico, and points south, snaking along the Animas River not far from the Nelson place before doing so. At a platform and siding not far from La Posta, near where County Roads 215 and 216 meet today, the Nelsons loaded their cream cans for delivery to Durango. When the cream was sold, they’d get credit at the creamery. Often when the cans came back to the siding they’d be tossed off the train, the engineer having a schedule to keep. It was the farmers’ chore (or their kids’) to retrieve the often dented cans, some in a bush or hidden in the grass. The Nelsons also sent eggs to town on the train and sold fryers – young chickens weighing 3-4 pounds that generally can serve a family. Once a week the Nelsons would come to town via train or La Posta Road (via horse coach and later automobile) to redeem their credit and go shopping for household necessities. 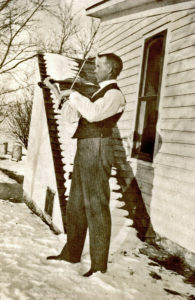 When they went by coach – the “spring wagon” – John Malcolm Nelson would take out his violin and play, whiling away the miles singing Swedish songs. He was said to have a beautiful singing voice. 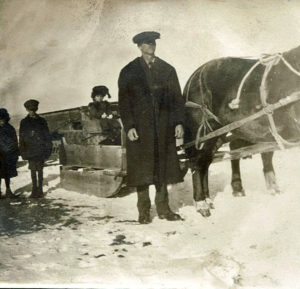 John Malcolm Nelson hitches up the winter sleigh, with the kids ready to ride. Ruby took advantage of her head start, began school at age 4, and became an excellent student. Spelling bees were a big deal back then – so were penmanship and long division, but that’s another story – and Ruby won a local spelling contest and earned the right to attend a regional competition. The 1930 Census shows the Nelsons owned their own general farm, as well as a radio set (TVs were still a couple of decades off), and the three children still lived with them. 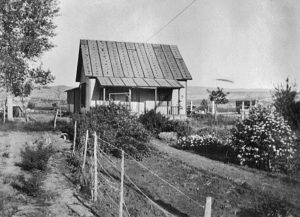 The Nelsons apparently had the first radio in the area, and neighbors would gather to listen. [i] Ruby went to school at Sunnyside (a school her father had helped to construct) through tenth grade, but for high school she went to town. Ruby at her 8th grade graduation, Sunnyside school. Transportation such as trains and horses being slow, and living in an age when a family was doing well to have one automobile – the Nelsons bought their first vehicle, a used Dodge truck, in 1927 – rural kids of the 1930s often went to live in town to attend high school. Daily commutes took too long, and there was no bus service. The students would hook up with city-dwelling families who wanted a boarder, and generally the boarder would work around the home and babysit in return for room and board. That’s what Ruby did for her final two years of high school. The first year she shared a room with Dorothy Craig during the week, then boarded the Denver & Rio Grande Western to go home for the weekend. Ruby was well-liked by the family she stayed with the second year. 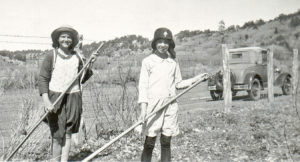 Ruby, left, and a friend work the field at the Sunnyside home. When Ruby graduated from high school in 1933, second in her class, she was just 16 going on 17. She would have liked to attend college, as her older brother and sister got to do, but in that respect Ruby was a victim of the times. The Great Depression had hit, lowering prices of farm goods and making life difficult for many families. College was a luxury the Nelsons couldn’t afford for their youngest daughter. 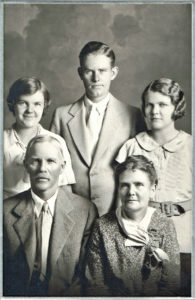 Nelson family portrait, around 1930. Top row: Ruby, John E., Amy. Also by then, John Nelson was 64 and Myra Nelson was 57. They needed more care and help around the farm as they aged. Ruby helped around the farm and eventually returned to town, where she took on a variety of jobs. Some cats have it good. 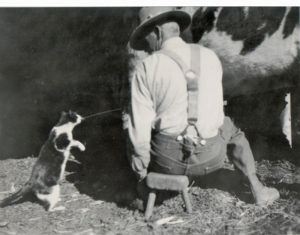 John Malcolm Nelson shoots a stream of milk directly from cow udder to cat mouth. One of those jobs was at Hermosa Flower Shop, on Ninth Street, just east of Main in downtown Durango. The shop was owned by Leonard and Laura Zink. Ruby later transferred to Leonard and Laura’s greenhouses and orchards in Hermosa. There, she worked in their white Victorian house on the south side of Hermosa Creek, and worked some in the greenhouse. She lived there, too. Leonard’s brother John also worked at the nursery and lived at the house. Ruby and John had met in high school, but only now would become well-acquainted. Silverton Standard, 2005 Summer Guide, “River of Lost Souls,” by Jonathan Thompson. Interview with John W. and Ruby Zink’s descendants: Ed Zink, Jerry Zink, Anne Zink Putnam, Heidi Zink and Kristi Zink, Nov. 20, 2016. Our Family History, compiled by Ida Zink Kolb. Oral histories of Ruby and John Zink apparently put together in 1982 by Marty Hartmann. [i] Email from Heidi Zink, March 10, 2017. Heidi was told this by her grandfather, Merl Short, who grew up in the Sunnyside area. Durango Herald, Ruby Zink’s obituary, September 22, 2004. Durango Herald, September 22, 2004.